On one of the machines I installed WRSA complete there is no icon in the tray. I can see the program listed under My Computer, and even send a shortcut to the desktop but it won't open up. The only way I can get it to scan is to click on the C:drive and have it do a scan with Web Root. Can someone help? I did try to reinstall it with using administrator as my log in, but that still did not help. So I did some searching on the internet and found an older page that has a long list of solutions, so I picked a simple one and it worked. Now we're getting back to the main problem, the sporadic missing of various icons, particularly after the first logon after booting. Typically missing are the power icon or the sound volume icon, but many others can be affected just as well. The immediate workaround is to log off and log on again (do not reboot, only log off). In many cases the icons then reappear. If not, you can try to repeat the procedure until you have all of them. If this works, then most likely you have the central problem described in this article. It is a second step and I am not sure if I want to try something more permanent, but at least I have it up where it belongs now. There is a setting within the program to have the icon in the system tray, but it should be checked by default. When you first installed Webroot SecureAnywhere, was there an icon in the system tray? Did you have any problems loading it at first or did this just happen all of the sudden? Can you get the program open from the Start menu>All programs>Webroot SecureAnywhere? Is WSA running in your task manager? Let me know and I'll help you accordingly! I will be out this afternoon and may not be able to answer until later. I honestly can't remember if there ever was an icon from the beginning, I only discovered it when I went to do rescan it last night. There is no sign of the program from Start, All Programs and that was why I went to My computer and scanned the C:Drive, but obviously it was doing a scan of the whole drive because I had to shut it off after 51 minutes and about 27 minutes of scanning. I have to leave the house this afternoon and won't be back until late this evening, but I am going to turn it on before I go and check to see if it turns up. If I do see it I will try to post that at least before I go and will check back later tonight to see if there is anything to add here. Do you still have avast on that system? And also you said that you were dealing with avast concerning possible issues or malware? It sounds as you have a corrupt install can you please go to Add/Remove and uninstall WSA and reboot and install a clean copy from Here and remember to keep a copy of your keycode as you will need it again for reinstall and Please report back to see if everything is running properly for you and you see a Tray Icon and see Webroot SecureAnywhere in the Start Menu! I went back to the machine and it does show up in Start Menu, Alll Programs and I can run it from there, I don't remember seeing it there last night, I tried to spot it but gave up and went to My Computer etc. I will try to uninstall it later and see if it comes to the tray. Also, on the computer that we refer to as the main one, it is stalling to where I can't get my email to come in. I do still have Avast on these machines and even after "cleaning up" with Avast WebRoot found a couple more issues. They are clean right now though. I will have to leave it at this for now and will get back when I have a chance later. TripleHelix definitely has a good point. You can uninstall/reinstall if necessary and that should fix up the problem as the system tray icon setting will be on by default. 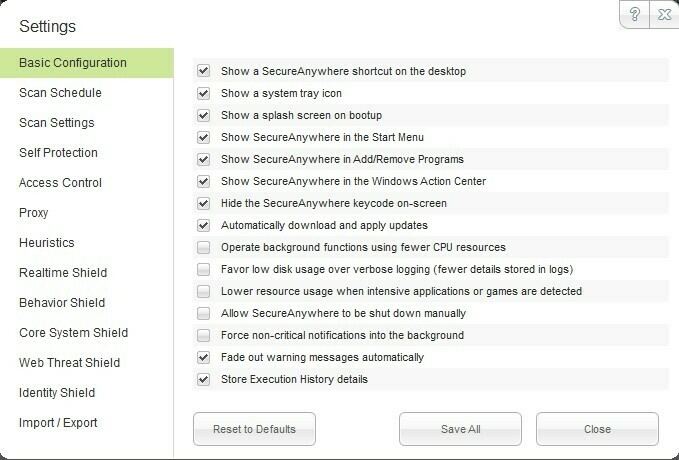 However, because you said you can find and open Webroot SecureAnywhere from your Start menu, you can also simply click the "PC Security" tab within Webroot, click "Change scan settings", click "Basic Configuration" and see if the "Show a system tray icon" option is checked. If not, check it and click "Save All". You should then see the icon appear in your system tray. Let me know. That`s fine I will be online till Midnight (EDT) before you reinstall see if you can open the main GUI and if you can go into Settings > Basic Configuration and make sure there is a check mark to Show a System Tray Icon and reboot to see if it shows! When I came back I did look at the settings and it was checked off to show the icon in the tray, but it wasn't there. So, I uninstalled the program, restarted the machine and then I did a new download for the program and installed it. Right after it did the initial scan the icon was in the tray. Without doing anything else I restarted the computer and once it came up the icon was no longer in the tray. It does show up in the Start Menu, All Programs, so what I think I will do is just put a shortcut in a custom toolbar I use right next to the tray. That way when I want to access it, it will be available for me to use it as if it is in the tray itself. This could be a problem with this particular computer and I am okay with it. One question, should the settings be the same as your image? There are a few things that are slightly different on my machine. Can I attach a.jpg here? If so I don't see it. Sorry to hear about the Tray Icon as the Webroot staff here is off for the weekend it would be best to Submit a Support Ticket as the Webroot support inbox is staffed 24/7 and they can work with you to find the problem and the picture I posted is just my settings that I like but default settings are very secure! Also the link I posted ealier to the Online Help File does show you all the settings and you can set it up the way you like it after thay find out why the Tray Icon is not staying around. Please keep us updated! Thank you Triple Helix, After thinking about it I am going to leave it as it is because I use my custom toolbar on all my computers, I just made a folder called 1 (one) and I put the programs we use the most in there and my husband and I both have been using it this way for years. If the machine gives me any more problems I will submit a Support Ticket. I am finding this forum to be very helpful since I have only been here a couple of days. which is set by Default so I would contact support just for that reason! That's a nice little machine from Newegg I use a Power user Laptop from Dell as I do allot of testing and use VM's such as you see in my signature! Okay, I see your point. I will post back when I find out what I need to know. Thank you for everything. Your very Welcome! And the support inbox is the best I have ever seen and you will be very happy with them! I would have kept them here but we are still collecting data on such issues. It seems like I had it with an older machine, can't remember where that one is now, but it rings a bell. I guess I can just enjoy using WebRoot. By the way I took Avast off two machines, does it make sense to put it back? Really you don't need Avast, WSA is a very strong Anti-Malware and is very smart an it's all I use! This is a great video on how WSA works with an unknown malware! http://www.youtube.com/watch?v=uKMZ1Ukw_7I Enjoy! Also if you get an infection that WSA can't remove Webroot has many Malware removal Experts and if needed they will connect to your system via remote and clean it themselves that's part of the guarantee of your subscription! One thiing I didn't say was that wasn't just the WebRoot icon that came back but several others. It was a lucky find, plus TH found something similar.